The Arctic is the one place no one argues about or disputes the rapidly changing climate. The ice pack has shrunk so much ...that two ships are now attempting a polar circumnavigation of the globe by sailing along both the Canadian and Russian Arctic coastlines. The current gold rush that's taking place for the Arctic's riches would not be happening of course if it were not for climate change. Polar nations are currently in a race to stake claims over the continental shelves of the Arctic Ocean that, before global warming kicked in, were once inaccessible. 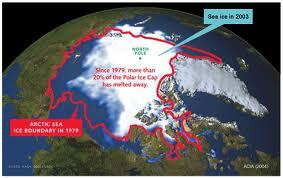 In fact just this year, Arctic sea ice extent reached its third-lowest level on record. Even more troubling this week the National Snow and Ice Data Center (NSIDC) reported that it's not just the extent that's shrinking but the thickness of the ice -- that is the total ice volume is diminishing and the older and thickest sea ice is rapidly disappearing. Needless to say with change happening so rapidly it's important to get Arctic territorial disputes settled as fast as possible so as get to the business of exploiting it. With that in mind it was announced on Wednesday that Russia and Norway had settled their Arctic boundary disputes (they divvied up 175,000 square kilometers of ocean) so that a vast estimated reservoir of 40 billion barrels of oil can now be exploited. For Canada, settling their bilateral disputes with the U.S. and Denmark the smart thing to do sooner rather than later as there are other issues in play as well as other claims. Canada, Denmark, Norway, Russia and the United States are all expected to file ambitious, competing and overlapping claims stretching towards and even beyond the North Pole. They must also sort out Canada's claim that the Northwest Passage is sovereign waters, an assertion rejected by Washington and other powers who believe it should be an international passage like other key maritime lanes. Canada does however have legitimate concerns about the state of the ships that will eventually be using the Passage as a major spill could cause untold and lasting damage to very delicate eco-systems. Canada needs to move forward quickly and decisively on these issues as waiting for the UN to sort this all out might not be the most rewarding strategy. Yet, Canada's Minister of Foreign Affairs, Lawrence Cannon has rejected calls from those who believe the rapidly changing Arctic ...warmed, accessible and at risk as never before in human history – needs a new international regime to control the area. So just sit back and hope for the best then, is the Tory strategy for claiming Canada's stake in the Arctic?